This is a fantastically rich lasagne, filled with spinach, cheese and walnuts all coated in a lovely creamy bechamel sauce. It's super-simple to make and is vegetarian to boot - but it's also very, very taste. Melt butter in a large saucepan until white froth appears. Add the flour and cook, stirring, for 3-4 minutes. Gradually add the milk, a little at a time, until all of the milk has been added and the sauce is smooth. Simmer for ten minutes, season with salt, pepper and nutmeg and set to one side whilst you assemble the rest of the lasagne. Stir in the gorgonzola until it has melted. Heat the oven to 180C. 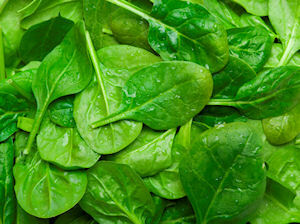 Heat the oil in a large frying pan and cook the spinach until wilted, then season with salt, pepper and nutmeg. Toast the walnuts in a dry frying pan until fragrant, which will take a couple of minutes, then roughly chop them. Spread the bottom of a baking tin with a quarter of the spinach, nuts and bechamel sauce, then repeat until you've used up all of the ingredients, ending with the bechamel sauce on top. Sprinkle with the Parmesan. Put the lasagne into a 180C oven for half an hour to 40 minutes until cooked and golden. You may need to cover it with foil to stop it getting too browned. Add some onion through the spinach mixture to add a little bit of sweetness and flavour. This recipe serves 6.